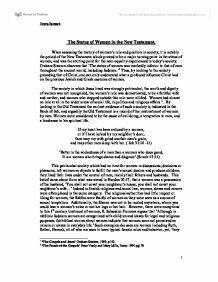 The Status of Women in the New Testament. 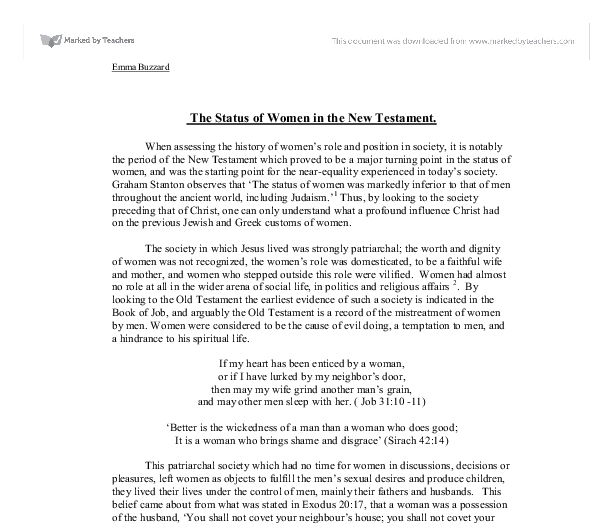 When assessing the history of women's role and position in society, it is notably the period of the New Testament which proved to be a major turning point in the status of women, and was the starting point for the near-equality experienced in today's society. Graham Stanton observes that 'The status of women was markedly inferior to that of men throughout the ancient world, including Judaism. '1 Thus, by looking to the society preceding that of Christ, one can only understand what a profound influence Christ had on the previous Jewish and Greek customs of women. The society in which Jesus lived was strongly patriarchal; the worth and dignity of women was not recognized, the women's role was domesticated, to be a faithful wife and mother, and women who stepped outside this role were vilified. Women had almost no role at all in the wider arena of social life, in politics and religious affairs 2. By looking to the Old Testament the earliest evidence of such a society is indicated in the Book of Job, and arguably the Old Testament is a record of the mistreatment of women by men. Women were considered to be the cause of evil doing, a temptation to men, and a hindrance to his spiritual life. If my heart has been enticed by a woman, or if I have lurked by my neighbor's door, then may my wife grind another man's grain, and may other men sleep with her. ( Job 31:10 -11) 'Better is the wickedness of a man than a woman who does good; It is a woman who brings shame and disgrace' (Sirach 42:14) This patriarchal society which had no time for women in discussions, decisions or pleasures, left women as objects to fulfill the men's sexual desires and produce children, they lived their lives under the control of men, mainly their fathers and husbands. ...read more. and when Peter denied him, followed him and were present at his crucifixion, death and burial''11 they are portrayed as dedicated and faithful follows who have been able to see through their suffering. The one woman who even at the time of Jesus' birth through to today holds a superior position in the church is Mary mother of Jesus. Mary is shown as a dedicated and obedient disciple of Jesus, 'She agreed to accept Jesus' birth and to be obedient to God's will while knowing well that this would place her in a position of being a social outcast'.12 The Gospel writers support her and highlight her considerable strength and bravery from the beginning of the Gospel- Jesus' birth, through to his death at the end of the Gospel. It is telling that Luke compared to Matthew tells the birth story from Mary's point of view rather than Josephs', as we have seen Luke is strongly aware of the difficulties which beset women in New Testament society and hugely supports Mary mother of Jesus who he feels represents the faithful and long suffering women and disciple. In the second century document called The Gospel of Mary, written about Mary Magdalene there are indications towards the role that she carried with the disciples that is ignored in her presentation in the New Testament. ''We find Mary Magdalene consoling the disciples after Jesus' ascension 'Do not weep and do not sorrow and above all do not be indecisive. His grace will be with you and will protect you.' Peter turns to her and says: 'Sister, we know that the Saviour loved you more than other women. Tell us those words of his, which you remember and know, not us...''.13 This shows Mary holding a somewhat authoritative position towards the disciples and the passage indicates Mary had a personal relationship with Jesus outside that with the disciples, of such an authoritative position that she holds, however, was omitted or not specified in the New Testament, although the ...read more. Certainly the Gospels indicate to the reader that Jesus wished to depict women as having just as many rights as men in the eyes of God. Furthermore, he showed that he himself saw women as equal beings to men, since he allowed them to become his disciples, as in the case of the Galilean women. So the gospels project them as being Jesus' true disciples. The period of the New Testament marks a significant change in the role and attitude to women, which seems to have been initiated by Jesus. It was this dramatic change in attitude to women (although the early church did not always reflect these teachings) that has finally become the standard to which modern day women aspire and society have accepted. 'People are welcomed by Jesus irrespective of race, status, or gender, and those who are called to leadership are chosen on the basis of God's gracious spirit not on accidents of birth. '18 1 'The Gospels and Jesus' Graham Stanton, 1989, p102 2 'The Puzzle of the Gospels' Peter Vardy and Mary Mills, Fount 1995 pg170 3 'In Memory of Her' E. Schussler Fiorenza 1983, pg 109 4 'The New Testament World' J. and K. Court, Prentice-Hall, 1990 5 'Equal to Serve' G.G. Hull 1989, pg85 6 Ibid 7 'Puzzle of the Gospels' Peter Vardy and Mary Mills, 1995, pg173. 8 'In Memory of Her' E. Schussler Fiorenza 1983 9 ibid pg 316 10 'The Gospels and Jesus' Graham Stanton, OUP (1989) pg202 11 'Mary Magdalene and Many Others' Carla Ricci, BURNS & OATES (1994), pg144 12 'The Puzzle of the Gospels' Vardy and Mills, pg175 13 'May Magdalene and Many Others' Carla Ricci, pg147 14 information from 'Paul's teaching on the Ministry of Women' P. Nelson, Whittles Publishing (1996) 15 'The New Dictionary of Christian Ethics and Pastoral Theology' IVP(1996) pg 595. 16 ' Paul and the Eschatological woman' R. Scroggs. Pg266 17 'Dictionary of Christian Ethics and Pastoral Theology' pg380 18 'Oxford dictionary of the Bible' W.R.F. Brownig. Pg 398 ?? ?? ?? ?? Emma Buzzard 1 ...read more. Examine why the writers of the synoptic gospels edited the material they used. It is clear from Genesis God had a special relationship with his covenant people (Israel) and he chose them , delivered them and told them how to live. However , it is clear from the Old Testament that God cares for the Gentiles as well as his chosen people , he is seen as the God of the whole earth. He asked the Pharisees 'is it lawful to heal on the Sabbath?' and no one replied to him. Jesus then healed the man and sent him away. In the aftermath Jesus asked them 'If one of you has a son or an ox that falls into a well on a Sabbath will you not immediately pull him out?" Lightfoot said "it was not Augustine, but Aidan who was the true apostle of England." Aidan and his followers restored Christianity to the areas that had lapsed, and won over the new areas that predecessors were unable to conquer. Finian succeeded Aidan to the bishopric, and abbacy of Lindesfarne. I know many Christians who, even though Mill would say have little individuality because of their religion, discuss and debate their opinions as much as any atheist I know and therefore avoid being caught in the trap of dead dogma. They can also empathise with Jesus' frustration at the fact that he is not producing the effect he intended, even having performed great miracles before people's eyes, and so begin to know Jesus as a person as well as his divinity.